Home / Blog / News / Voter ID Card online way to transfer to another state? 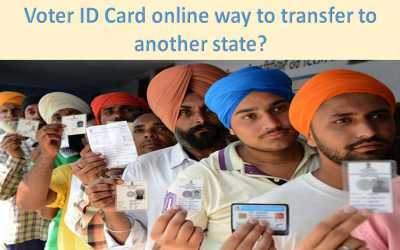 Voter ID Card online way to transfer to another state? Prior to the 2019 Lok Sabha elections, Madhya Pradesh, Rajasthan, Chhattisgarh, Mizoram, and Telangana assembly elections will be held later this year. If you are shifting from one state to another state, in such a situation, there will definitely be many questions related to the Voter ID Card in your mind. After the shift to another state, you will not need to create a new ID card. After changing the city, you must first update your address with a change in Legislative Assembly / Parliamentary constituency. You can change the address on your existing voter ID card and in order to do this, you do not need to circle the Voter ID card office. Today we will tell our readers how you can make changes to the Voter ID Card sitting at home. There are some important steps for this that you have to follow. 1) First of all, you have to go to the National Voter Service Portal website www.nvsp.in. 2) At the bottom of the National Voter Service Portal, you will see an option to improve the entries in the voter list. 3) After clicking on the improvement of entries in the voter's list, the form 8 form will open. 4) At the top, you will see the decision of the State / Legislative Assembly / Parliamentary constituency. 5) Do not forget to fill the names, part number of electoral rolls, a serial number of electoral rolls. 7) Enter your current address. 8) Enter electoral photo ID number. 9) Then upload the latest photo, valid ID and address proof document. 10) On Dor e number, you have to select the details you want to fix. 11) Please provide mobile number and email id. 12) After filling the requested information and reading carefully, click the submit button. These documents will be needed for change in the Voter ID Card.